So, you may have thought August and festival season is over, but no, we’ve got the brilliant Edinburgh Mela festival keeping up the energy and bringing us delightfully into September ! Taking place over the weekend of 1st and 2nd September, the Mela promises to bring you a diverse programme of music and dance which incorporated local and international acts, representing a wealth of countries and continents, from India, Africa, China, and the Arab nations. There will also be lots of great stalls, with food, clothing and much much more…. 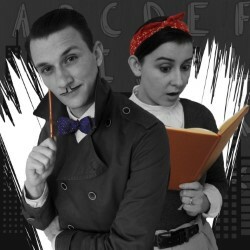 After an incredible response from audiences and critics, and the overwhelming demand for new recruits wanting to join them,The Bureau Of Untold Stories will extend it’s run at this year’s Edinburgh Festival Fringe with an additional performance on Sunday the 26th of August at the Museum Of Childhood. The Bureau Of Untold Stories sees inspectors Dexter Sharpe and Poppy Hasluck on the hunt for The Eraser, an elusive criminal mastermind guilty of stealing the world’s stories. But with outrageous accents, some unconventional storytelling skills, live sound effects, and YOUR help, The Bureau Of Untold Stories is going to get them back. See you there to help unravel the mystery !! So, its been another whirlwind of a week at the festival, and it’s hard to keep up with some of the fab shows we’ve seen, we’ve also been back to the hot donut stall in Assembly Gardens, and enjoying the gelatos from the stall next door !! The Edinburgh International Book Festival is now officially open and you can head down there to browse the wonderful children’s book store or to take part in some of the fantastic free arts and crafts activities they have in the Baillie Gifford StoryBox. David Baddiels’s AniMalcolm – We loved this musical ! Very slick, professional and hugely absorbing….Malcolm wakes on his 11th birthday and isn’t that impressed with his presents – Malcolm does not like animals and he’s very soon surrounded by them. This finishes tomorrow though – the 19th so best be quick !! Denim : The Denim Juniors –Denim is the place to scream, dream, and become a queen. Five pop princesses celebrate the power of being yourself. For something spectacularly different and altogether fabulous, join Denim as they remind us all to be ourselves, sing loud and proud and add a lot of glitter and sparkle in the process…(Read our full review here). 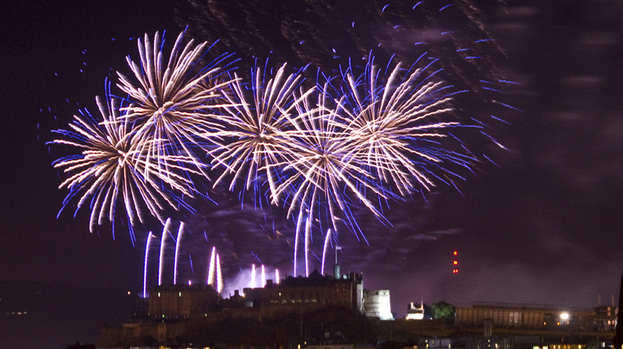 Again though one chance only to see this – it finishes on the 19th too…. The Amazing Bubble Man – He begins with smaller bubbles and works big before creating bubbles that rise to the ceiling, smoke filled bubbles, bubble sculptures and even fantastical hat creations. With added live music too to really bring the show together – get a good seat at the front and enjoy !! The Gruffalo, The Witch and The Warthog with Julia Donaldson – This show captivates all of the magic of the books and much much more….the stories come to life on stage before us and is very much a family affair with Julia Donaldson herself, her husband, sister, and two friends. The well loved stories Room on the Broom, the Gruffalo and Superworm are enthusiastically shared, as are the newer, lesser known Magic Paintbrush and the Ugly Five. Shift – This stunning dance/physical theatre piece from Barely Methodical Troupe is flawless. It is bold, brave and blue ! Featuring an abundance of uses for an elastic band, the performers flip, jump, glide and slide across the stage. The accompanying musical soundtrack is awesome and as the boundaries are pushed from the stage into the audience, we are completely taken along on the playful journey….a thing of beauty.